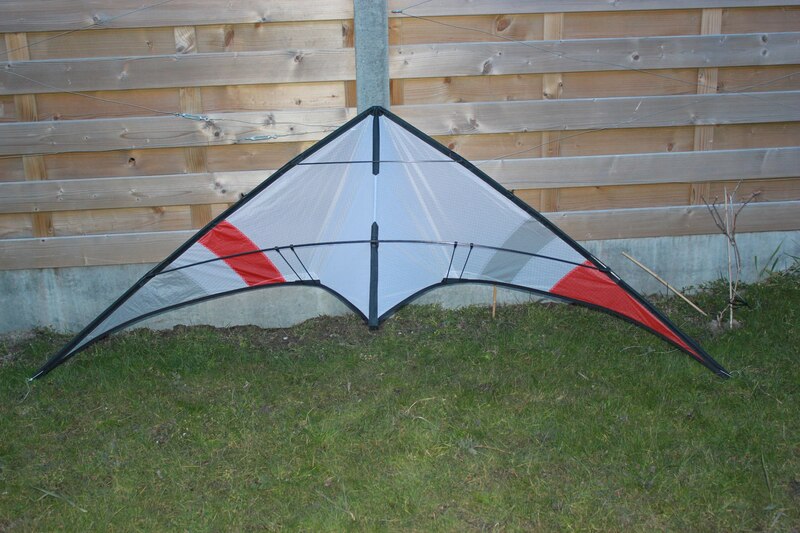 The Essence was Pim Kusters’ first freestyle/tricks competition kite design. Very capable in the tricks department, nice feedback on the lines but without excessive pull and quite precise. After Dutchkites and (later) WindFactory stopped building the Essence there was some tweaking done by Essence fan Pierre Terbogt. He also made a SUL version of the kite based on the UL specs which is very trickable kite with very flat backspins, lazies and flatspins. Pim gave a few of us permissing to build Essence’s ourselves and a lot of (SUL) Essences were build. From now on it will be available as an open source plan. We’ll start with the Single color SUL version. The other versions with the original panel layout will follow after a while. NB. This is no step by step explaination on how to build a trickkite. There are numerous websites and fora which explain this. A great resource is Tom’s step by step Le Quartz website. Thanks! The Essence in the pic is my STD. That one was build by WindFactory. White and Slate. Heavily refurbished and tweaked to the the latest specs. Great kite. is the sail the same shape as the SUL? (with obviously different panel layout). I may build a Std sail along with an SUL but make my own pattern. What frame is in your Std? Sailshape might be a little different, but it was based on a Windfactory sail. I've build another STD based on these plans and that flies very good! The specs are in the link, just scroll down to the Essence STD. Looking forward to your builds! From my knowledge, I can highly recommend the Essence SUL, it's the perfect low wind trick kite for those who can fly all the modern day tricks! I've seen the Essence SUL in the hands of several competition pilots and it never stops in amazing me by what is possible in the faintest of winds. Added some close up pictures. A few photos of an Essence sul I've just finished. Framed with the recommended 2PT, 3PT, P100 and 4.5 carbon the roll bars have not been fitted as I am having trouble finding a supplier of 2 mm spiral wound glassfibre. Experimented using Airx 500n for the sail as its a lighter fabric than Icarex PC31 the Airx shares a lot of properties with Icarex and produces a nice finish I guess only time will tell if it has the longevity of Icarex. After a few hours flying in 4 to 6 knot wind I agree with Positivo comments if your looking at building an sul you wont be disappointed with an Essence. Thanks Pim for allowing the kite to be open source. Nice Essence SUL Mat, very curious about the lighter sail. I've added your picture to the builds page. The Essence in action at the hands of a novice. Over the last few months the Essence and I have done quite a bit of flying at my local beach which is hard sand and shell grit (very abrasive) and I am glad to say the Airx 500 is holding up well did snap a 2PT LLE spar just below the lower spreader APA trying a wind tip landing when the wind was up a bit. I'm also working on digital drawings based on Pim's original templates. very nice! Both the kite and the flying. Are you sure the specs correspond to an SUL? Kareloh, do you confirm this weight?